When we use the term pig, the first thing that probably came into your mind would be a swine. However, when the term hog is used, some of you may find it new whereas others may recall a swine once again. For the latter group, it is easy to say that a hog is a swine. However, if asked about a pig, then that too will be defined as a pig. None of this is false but that does not mean that the two are exactly the same. There are some differences as we will soon point out. The difference becomes more obvious when we talk about farms, farmers or farming. Pig farms and hog farms are different and so is hog and pig farming except from those farms that have pigs and hogs both. By definition, a hog is any of the various mammals from the family Suidae; a classification that includes the domesticated pig as well as some other wild species of swine (such as the boar and the wart hog). On the other hand, a pig also refers to the members of the Suidae family, but they usually have short legs, bristly hair, cloven hooves, a cartilaginous snout (that it uses for digging, especially the domesticated hog). The most important difference between the two is with regard to the size and age of the animal. Talking about the United States of America, pig is used to describe a swine that is young and usually domesticated. Therefore if you know that a swine is quite young, that is, a few years old, you know it is a pig and not a hog. Conversely, a hog is used to describe older swine, that is, those that are more than a few years old. This difference is not so clearly defined because it is a bit vague to say few years old or greater than a few years old. How many years does this few years refer to? The answer can be different for various people, and in particular pig or hog farmers. A better way would be to differentiate the two on the basis of their weight, or mass to be more precise. The swine that have a very high weight are hogs whereas those that have a lesser weight are known as pigs. This difference is not as vague as the previous one as there is a benchmark from which to compare the weight and then conclude which swine is a hog and which a pig. In the United States and most parts of the world, if a swine weighs less than 120 pounds (which is equivalent to 50 kilograms), it is a pig. And if it weighs greater than 120 pounds then it is a hog. But this is not the case everywhere, an example being Great Britain where the term pig refers to all domesticated swine. It is also possible to differentiate the various swine with a commercial point of view. When their term pig is used, it normally refers to those swine who are not yet ready to be sold into the market (due to their lower age and weight). However, if the word hog is used, then one can be sure that it refers to the swine that are ready to be sold in the market, or are merely ‘finished products’ for sale. Therefore it can be safely said that pigs are those swine that are on the farm whereas hogs are those swine that are ready to be slaughtered. allana. "Differences between a hog and a pig." DifferenceBetween.net. 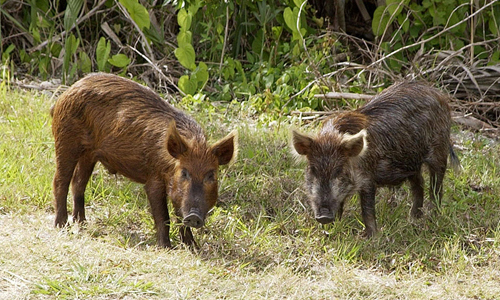 February 6, 2018 < http://www.differencebetween.net/science/nature/animals-nature/differences-between-a-hog-and-a-pig/ >.